Give your eat in kitchen or dining room a modern makeover with this stunningly designed chair. Made from plastic, this chair features a deep seat pocket and a declining waterfall edge that allows the sitting area to bend and transform it into an extremely comfortable chair. The black powder coated metal Eiffel style legs of this chair gives it a midcentury look, while the ocean blue finish makes it easy to coordinate with your existing decor. Use this chair as an accompaniment to the dining table, as a desk chair or even as an extra seating option. Deep seat back and waterfall edge of this chair relieves pressure on the back of thighs, providing hours of comfort. 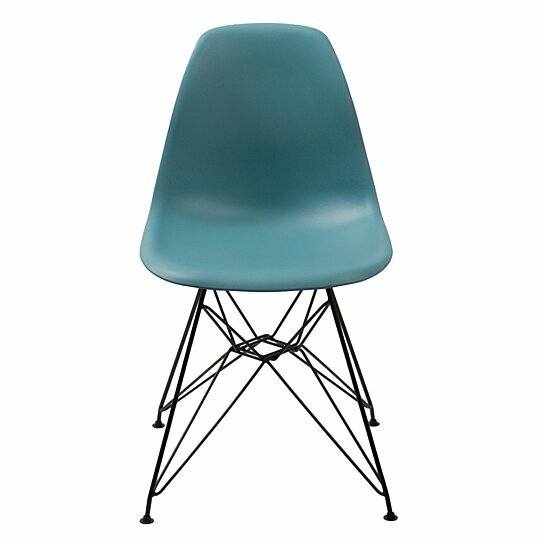 The chair is made from plastic and is supported by metal Eiffel style legs. Fitted with floor stoppers on each leg, this chair won't leave scratches on your marble or wooden flooring.